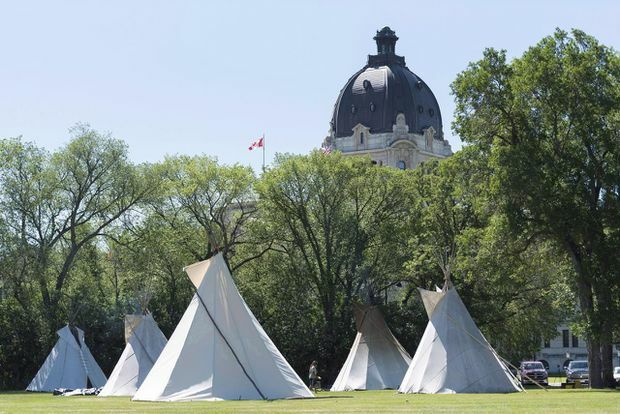 Tepees are seen at the Justice For Our Stolen Children Camp near the Saskatchewan legislature, in Regina, in a June 27, 2018, file photo. Tepees are starting to come down at an Indigenous protest camp on the grounds of the Saskatchewan legislature, but what the protesters do in the future remains unknown. There had been 15 tepees in the camp at one point, but that number was down to 10 by Monday morning. At least two of the tepees came down after the court order, while others were taken down for the annual Treaty 4 Gathering in Fort Qu’Appelle, Sask. “The chief has said he expects a resolution in the near future,” Popowich said in an emailed statement. No deadline was specified in Justice Ysanne Wilkinson’s order to take the camp down. Protester Richelle Dubois said it’s disheartening to see the number of tepees shrink. “It shows the province’s true colours and how they feel about First Nation children and communities,” she said. “We’re hopeful, hopeful that there’s still a future for our cause and there’s still a future for our children and our children still matter,” Dubois said. Lawyer Dan LeBlanc, who represents the protesters, wasn’t immediately available for comment. A spokesperson for the provincial government declined to comment further on the future of the camp. Pitawanakwat said spirits are good at the camp and people have been united since the court order. She wants the focus to be on issues they’ve brought forward, rather than bylaws and permissions.